Summer is in full swing around here (hello, one-hundred-degree weather! ), and I’m looking forward to spending my evenings at cook-outs laughing with old friends, hefeweizen in hand. And since chips and salsa are a mainstay at barbecues, I thought I’d share my favorite salsa recipe with you. It’s fresh, hearty and your vegetarian friends (like me!) will love you for it. You’ll end up with a ton of salsa, perfect for bringing to a party or enough to share for a week. 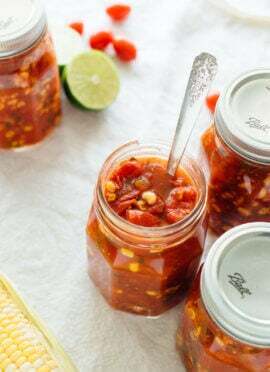 I’ll admit I’m a total salsa fiend, but I think it’s delicious with chips, quesadillas, in a Mexican-style salad, and even as a topping on omelettes and breakfast tacos. I love it on everything and I hope you do, too! 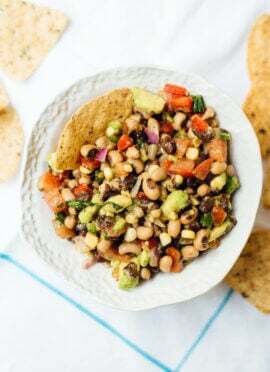 Update 8 years later: I think you might like this black bean salad more! 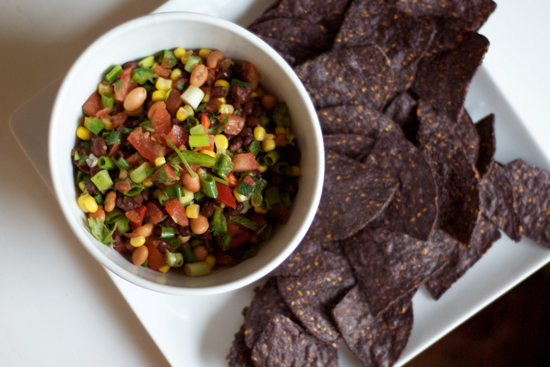 The best black bean salsa you’ll ever eat. Easy to make: just chop up the ingredients and mix together. Lime and a little vinegar send this salsa over the top! Fresh cilantro, chopped. I love cilantro so I use quite a bit, about half a bunch’s worth. Jalapeño (fresh or pickled) and or Fresno peppers (I used two of each) if you want to spice it up. 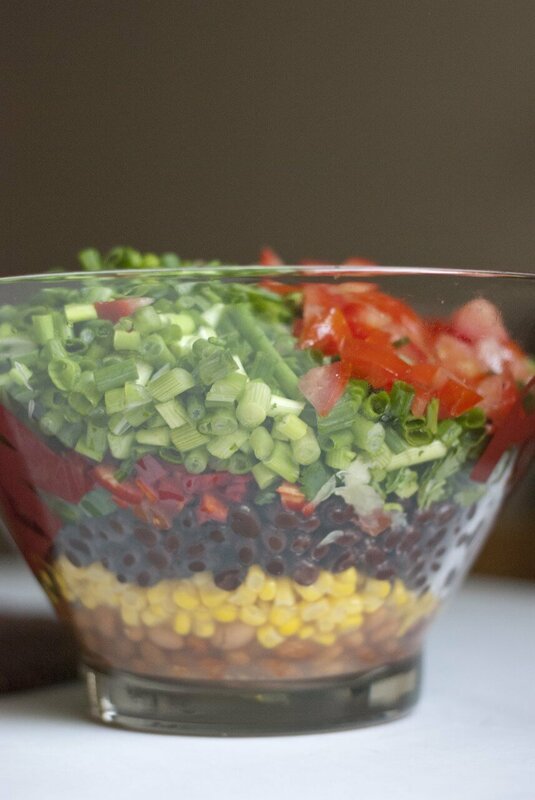 Toss all the ingredients into a big bowl, mix it up and chill for several hours. The longer, the better. Adapted from Rebeckah at Allrecipes. You can use canned vegetables or equivalent amounts of fresh vegetables instead. It’s a flexible recipe so mix it up as you please. *I am concerned about the BPA levels in canned tomato goods. Pomi and Muir Glen brands of canned tomatoes come in BPA-free containers. your photos are beautiful! Love the blog! Love your photos, KT, and the recipe looks great. I’ll adjust it a bit and try it. Keep them coming! @sterling style: I really enjoy your blog and I’m so glad you like mine, too. @LifestyleBohemia: I’m happy you found me, and I love your jewelry designs! Oooh, this looks positively spectacular! And so easy to make. I’m definitely going to be trying it. It’s my first time on your blog and I’m simply in love — I can’t wait for more! ok, this looks delicious. really, really delicious. thanks for the comment at greedy girl… i’m excited to find a fun okc blogger with excellent recipes! and good taste in beer! i’ll be following along. oh and YES you need to get to nyc soon. my favorite city ever. (it even tops paris!) now i need to try playa del carmen! I’m totally making this tonight! Caroline: Thank you!! I wanted to do a little dance after I read your comment. I’m dying to go to NYC, really I am! I should plan a trip for fall, there’s no point going now if it’s as hot as it is here! Sarah: I could totally call this a salsa/salad, couldn’t I? I pretty much treat it as such. one of my fave recipes! i put in on everything–it’s featured on my blog too! thx for the recipe! looks y-u-m-m-y!!! This recipe sounds delicious. But I’m even more caught up in the beautiful pictures – your presentation is impeccable. 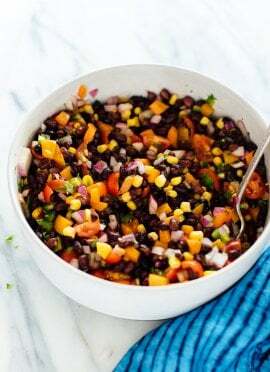 I have been looking everywhere for a great black bean salsa recipe and here it is! Thanks so much for sharing. I’ll be making this over the weekend for sure. Muir Glenn and Eden Foods use cans that are BPA free. They both have a great line of organic canned tomato products. I really appreciate the BPA free cans of the many varieties of beans that Eden offers. A staple for a broke girl in college :) love having this for dinner! Thanks, Mary! Glad you’re enjoying the salsa/salad! Thank you, Amy! I’m so glad to know you’re visiting and enjoying the recipes! oops should have posted my previous comment on your ACTUAL first post ever, but hope you get the idea! Hi Danie, I’m sorry, this is actually the very first recipe I ever wrote, and I can’t remember how much I used then. I’d guess at least 1/4 cup. Ok. Thank you for the reply. :) looking forward to trying this. So happy to find whole foods vegetarian recipes. Looks so Good! I have to make It! Again!Another fab recipe with great tips like your New cook book!!! Woo hooo and yahooo! WE love it!!!!! And so does everybody we gave copies too as well,so Thanks for that too!It is such a great and wonderful gift to give . 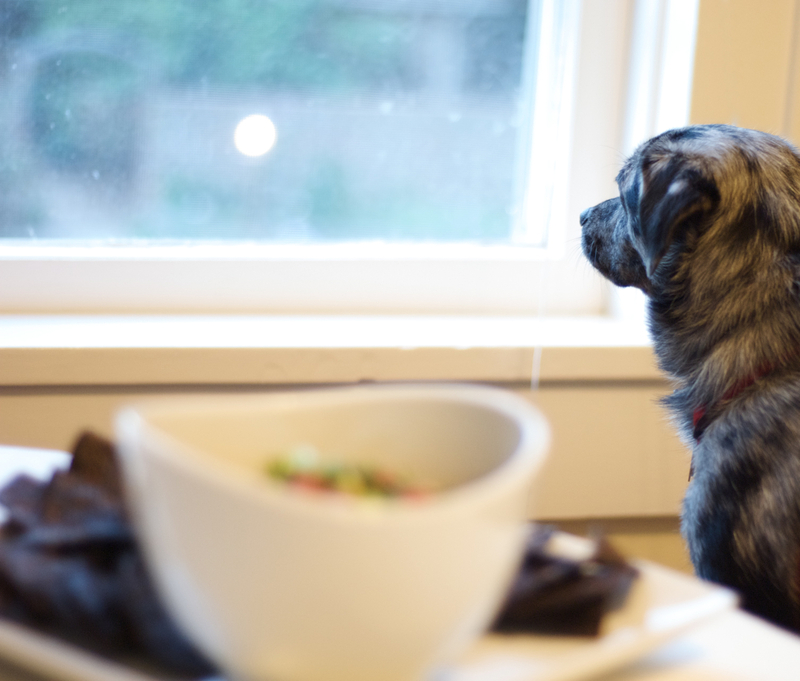 Your thoroughness and thoughtfulness to all types of eaters is so welcome! We are still eating your rosemary shortbread from Cookie and Kate-LOVE them and your kale white miso salad-YUM! Congrats to you Kate and of course Pats to cookie too! Thank you so much for your delicious and easy-to-make recipes! I’ve read your blog for years and always find something good&healthy to cook on a day I have no inspiration – and between those days of course. I’d like to ask you about those deep-brown chips in the pic. Is it something you have a recipe for?